With our curricula rooted in evidence-based practice, our nationally ranked MSW program integrates trauma-informed and human rights perspectives and offers the in-depth knowledge and skill building of our traditional program. Our online social work master's degree (MSW) program is fully accredited by the Council on Social Work Education (CSWE). Online courses can have both synchronous and asynchronous components to them. Faculty members will advise students on the number of synchronous sessions required in any course. 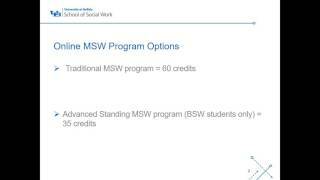 All Online MSW students will have priority enrollment for any foundation online course. While it is possible to complete the advanced year entirely online across many different focus areas, for specific interests not offered online, travel to the University at Buffalo School of Social Work would be required. The amount of travel depends on course selection. View the list of electives, advanced topics, and advanced interventions courses, which outlines the online, hybrid and seated course offerings for each course topic. Non-resident online MSW students (out-of-state and international) MUST take all of their coursework fully online in order to be eligible for the lower non-resident online tuition rate. If non-resident students register for a seated or hybrid course, they will be charged the full seated non-resident rate for ALL courses that semester. Field placements are specialized field training opportunities that allow students to explore the practice areas that interest them. Online students complete the in-person field placements in their home region. Due to the time and consistency required for field placements, students should not plan to relocate throughout the duration of study.